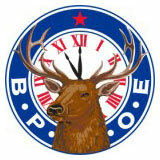 Public service is an integral part of being an Elk. In keeping with this tradition, Elks create and participate in many programs to better their communities and demonstrate that Elks Care - Elks Share! A monument in the truest sense, the Elks National Veterans Memorial was built in 1926 to honor Americans whose profound sacrifices for the nation can never be recognized by mere words. Since the early days of Elkdom, the Veterans Service Commission has patriotically served those Elks who have fought for our great nation. Through the Elks National Foundation's Community Investments Program, Lodges can apply for grants to serve their communities, meeting local needs.